I started participating in Relay for Life with my best friend Morgan, a two time brain tumor survivor. We created our first team in 8th grade, and I loved having the opportunity to help fight back against cancer. I knew I wanted to participate in college and was so excited to find such a passionate event leadership team at Middlebury. I have been on the event leadership team at Midd all four years, but had the most responsibility this year as one of four co-leads. 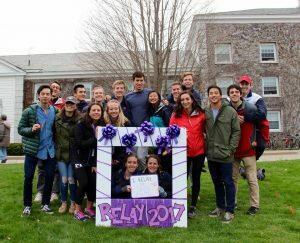 It has been an extremely rewarding experience to plan an event that our Middlebury community looks forward to every years, and to raise money for the American Cancer Society in the hope of seeing a world without cancer in our lifetime. I love how Relay for Life brings our entire community together. Both Middlebury College students and community members are able to spend an afternoon in solidarity, fighting back against a disease that impacts so many. For a few hours Relay lets us all come together to remember the loved ones we’ve lost, honor our survivors and show commitment to making sure no one else has to hear the words “you have cancer”. I feel as if planning and fundraising for Relay for Life is my way of helping put an end to this disease, and I am honored to contribute in this way. I think that in my time here, student support for Relay for Life has grown. The first two years, we held our event in Kenyon Hockey Arena, but the past two years it’s been outside on Battell Loop. Because Battell Loop is so central, we are able to draw in participants that are just walking by, especially when the weather is nice and students want to be outside instead of stuck in the library. On this day, students are able to spend time outside with friends, play lawn games and eat delicious, local food, all in support of a great cause. All of this encourages students to attend our event, and helps us in the fight against cancer. 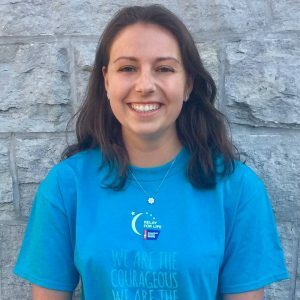 It has been an honor to serve on the event leadership team at Middlebury for so many years and I am thankful for the opportunity to help put an end to cancer.